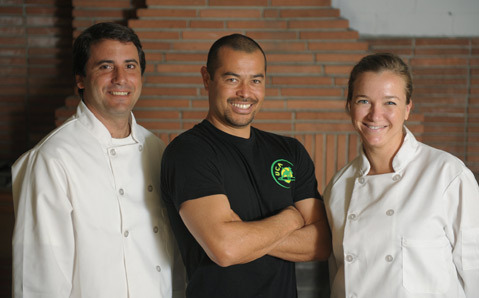 Brasil Arts Café owner Daniel “Chin” Yoshimi (center) with his chefs Carlos Lima and Lica Sfredo. With Carnival season upon us, we figured it was a fitting time to speak with Daniel “Chin” Yoshimi about his latest venture, which will bring the tastes of Brazilian culture to State Street. His is a popular face in the Santa Barbara community as he owns the Capoeira Sul de Bahia studio and has taught in town for over 10 years. The Brasil Arts Café will offer a wide selection of Brazilian food — serving breakfast, lunch, and dinner. The restaurant will also feature a Brazilian marketplace, with items direct from Brazil, including coffee, desserts, and premade items. And in true Carnival spirit, the café will also function as a dance studio — offering classes ranging from capoeira to samba to Brazilian drumming. 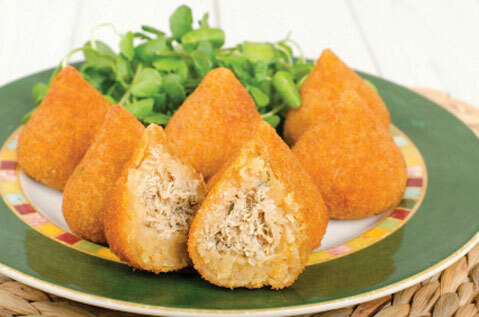 <i>Coxinhas</i> are deep-fried chicken croquettes and will be on the menu at Brasil Arts Café. One menu item classic to Carnival is feijoada, a pork and bean stew that has risen to become Brazil’s national dish. Other popular appetizers will include pão de queijo (gluten-free cheese rolls), coxinhas (deep-fried chicken croquettes), empadinhas (savory pastries filled with chicken or shrimp), and carne seca (dry aged beef). These Brazilian salgados have become popular street snacks for Carnival revelers. Other Brazilian favorites to be featured at the restaurant will include prato feito — a traditional special consisting of rice, beans, choice of protein, and farofa (a popular side dish for dipping). The café will also serve up moqueca, a white fish stew made from coconut milk, and decadent Brazilian desserts, such as flavored brigadeiros (chocolate balls made from condensed milk), crème de papaya, and pudim de leite (Brazilian flan). Slated to open mid-March, Brazilian chefs and SBCC graduates Lica Sfredo and Carlos Lima will be at the helm, creating traditional dishes with a flair for all that Brazilian food and culture has to offer. Brasil Arts Café will be located at 1230 State Street, (805) 637-5355, brasilartscafe.com.